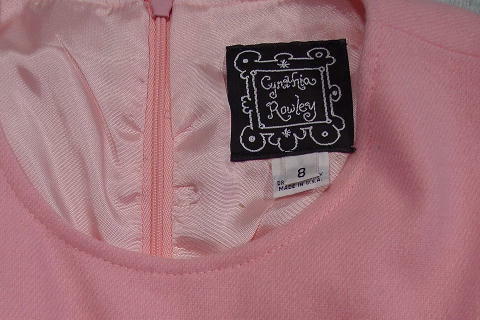 This pink wool dress is sleeveless (cut-in) and has a scoop neckline in the front with 2 slanted front pockets. There are two 2 1/2" darts above the waist and darts in the back. The faux attached belt has a black button in the center. It has a little bit of gathering above each pocket and in the back. It zips in the back and has a pink lining. The tag says size 8, but it fits more like a 4/6. It was purchased from a model in Miami. Be pretty in pink - it's one of the flattering colors for any age.